In this 555 circuit, the chip drives a SCR Bridge or Thyristor Bridge. The Phase control can control the power derived by the bank. This is like a Large dimmer. The control is at reset pin from a external pulse circuit. 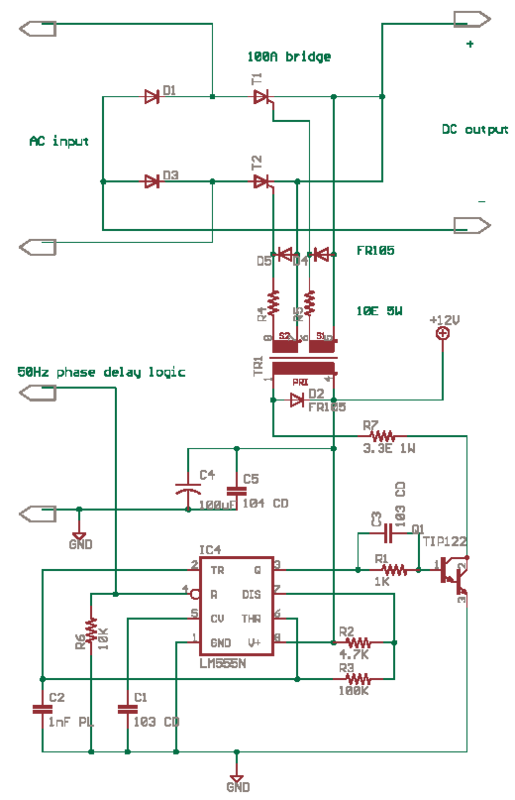 The Schematic Source file del00015.zip, Use the Eagle PCB and Schematic Design EDA Software. Thyristor Drive Circuits and Mosfet Circuits are very important in Power Electronics. They form the Output Stage Devices. Earlier Thyristors, SCR, Triacs, SCR Bridges were used in Motor Drives, Power Supplies and Large Battery Chargers. Some old Siemens Application Notes have High Frequency Inverters using SCRs!. Later the Mosfet was developed and started taking over the Main Position of the Output Power Device. NPN Transistors were the first favorite for such needs, SCRs were Robust and managed High Voltage and Current without much fuss. The Mosfets are very useful as they can be switched at higher frequency with less Power Loss or Heat. They can get damaged easily if the designs are not done carefully. Now we have IGBT - Insulated Gate Bipolar Transistor which combines the High Impedance of a MOSFET and the Toughness / Resilience of a Bipolar Transistor. Its an Inhibit, When pin 4 Reset is > 1V, device is ON. When Pin 4 is < 0.4V Output goes Low. When Reset goes high, Output is Low till 555 Triggered.